Marlon Brando recorded himself on audio cassette. One of his tapes is labeled Self-Hypnosis #2. Others tapes seem to be a form of talk therapy with himself. He once advised himself to throw the tapes away, but he must not have listened because writer/director/editor Stevan Riley assembles a feature documentary based on those tapes. A feature film built around audio recordings doesn’t sound like much of a film — even if the subject is Marlon Brando. But Riley finds plenty of footage from interviews, news stories, and movie clips to illustrate Brando’s musings. If you don’t know much about Brando, you’ll learn that he changed the face of acting for generations to come. He studied with Stella Adler, who studied under Stanislavski. When he worked in film, he brought an emotional naturalism to an industry where acting had been more stylized. You’ll learn about his childhood and early career, that he fell into acting almost by accident, that his great skill was lying and that actor was a better job than con man. You’ll learn that when he first out-earned his father, it strained an already-strained relationship. Marlon didn’t want to grow up to be his father. But Listen to Me, Marlon is probably best appreciated by those who have some knowledge of Brando already. It’s good for filling in the facts — or at least Brando’s version of them — around many of the Brando legends. If you’ve heard the legends — that he owned his own island, that he was impossible to work with — this film is for you. I had heard many of the legends. Sometimes his perspective seems defensive or skewed. But most of the time the recordings make Brando seem far less eccentric, far more human than the tabloids liked to present. But i hadn’t heard all of the legends. If you didn’t know “he owned his own island” his description of Tahiti and his frequent visits would just sound normal, and not defensive. Brando reveals, without intending to, why he was so hard to work with. He admits to having contempt for authority, and his cynicism toward the cinema industry makes one wonder why he stuck it out. He also mentioned how much he hated fame. He thought it was weird to met people who had already prejudged you. “I cant stand it, I hate it, you cant imagine how much of a panic it is.” And this was when people were prejudging him with praise. On the other hand, Brando says he says he really did want to make the best films possible. In short, he blames his sense of perfectionism on the creative differences with directors. That the shape of a film is not an actor’s job doesn’t seem to have entered into his thinking on the matter. Riley chooses as a touchstone Marlon’s marveling explanation that his face had been digitized, that his face would live on in a computer. 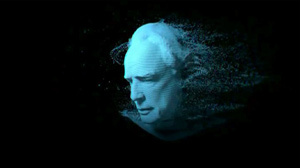 Riley brings back this digitized face as the ghost of Marlon again and again. In the end, Brando offers a few gems of wisdom. One is “I spent thousands in psychoanalysts which did absolutely nothing but stick screwdrivers in your brain. You’ve got to be your own analyst.” Thus was born the archive of tapes, perhaps. Riley closes with Brando’s advice to his younger self.